Food security is threatened by deteriorating soil quality and declining crop yields in Uganda and throughout Africa where a majority of the population relies on small-scale farming for its livelihood. 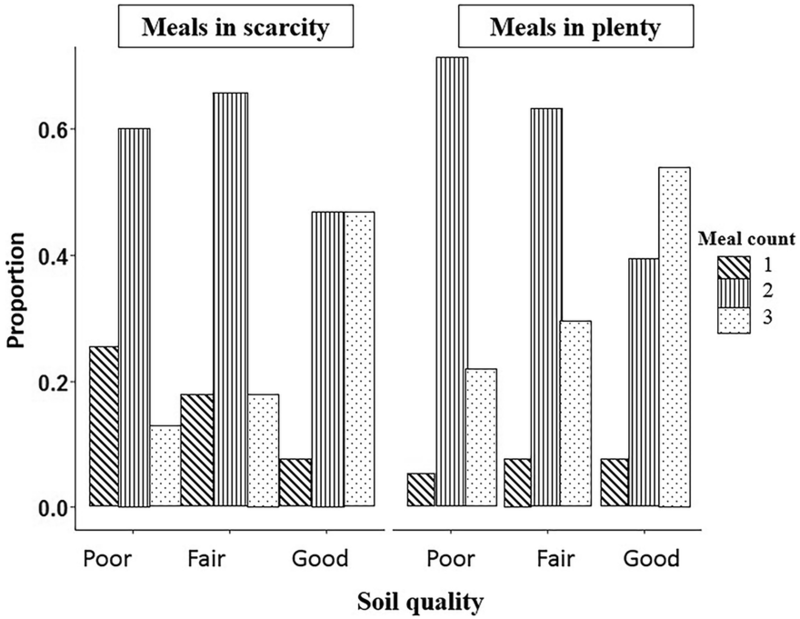 To understand these dynamics, this study investigates the relationships among soil quality, crop yields, socioeconomic factors (independent variables), and food security (dependent variable), measured as household meals per day, during the seasons of scarcity and plenty from interviews with 150 farmers in south-central Uganda. 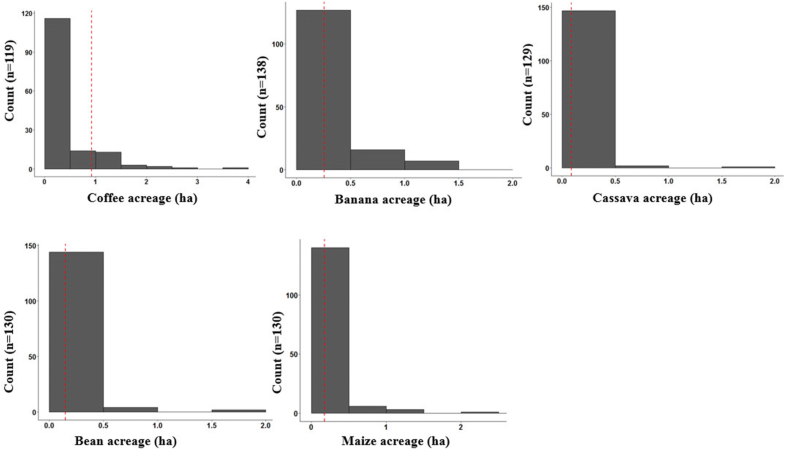 Using multivariate logistic regression, total acreage, and banana (Musa × paradisiaca L.) and bean (Phaseolus vulgaris L.) yields were positively associated with food security during the season of plenty (OR = 1.44, 1.86, and 2.21, respectively). During the period of scarcity, total acreage, and maize (Zea mays L.) and bean yields were associated with food security (OR = 1.70, 2.57, and 3.18, respectively), while off-farm income was associated with less food security (OR = 0.13). The results indicate that land size and crop yields are more important for smallholder food security than soil quality in terms of direct relationships. We recommend that land fragmentation and low crop yields should be addressed to improve food security in south-central Uganda. ‘Food security exists when all people, at all times, have physical and economic access to sufficient, safe, and nutritious food that meets their dietary needs and food preferences for an active and healthy life’ . Food insecurity remains one of the greatest global development challenges with 815 million people (11% of the global population) being food insecure in 2016 , despite declining steadily since 1990–1992. Food insecurity is manifest through hunger and, consequently, malnourishment. In sub-Saharan Africa (SSA), food insecurity constitutes a humanitarian crisis in which approximately 23% of the population is undernourished . This situation reflects high annual population growth (2.5%) without a corresponding growth in food supply. Food insecurity in SSA is the outcome of multiple causal factors: socioeconomic (high population growth, poor infrastructure, slow economic development) , political (government instability, corruption, lack of political transparency) , and biophysical (poor or deteriorating soils, deforestation, erratic rainfall patterns, crop pests, and diseases) . Agriculture plays a central role in food security, especially in SSA where most of the population depends on subsistence farming. However, agriculture’s impact is dependent on the availability of good quality soils and household socioeconomic status. It is important, therefore, to incorporate natural and human resources in the analysis of food security. This paper utilizes the sustainable livelihoods approach as an analytical tool to understand the association between capitals (assets) and food insecurity. Previous studies on food security demonstrate the importance of some of these assets . For example, human and financial assets (farm size, age, education, and income) are among the most common predictors of food security in SSA, as discussed below. A study in Kwara State, Nigeria, conducted by  utilizing logistic regression found farm size, gross farm income, and total non-farm income to be significant predictors of rural household food security measured as daily per capita calorie consumption. 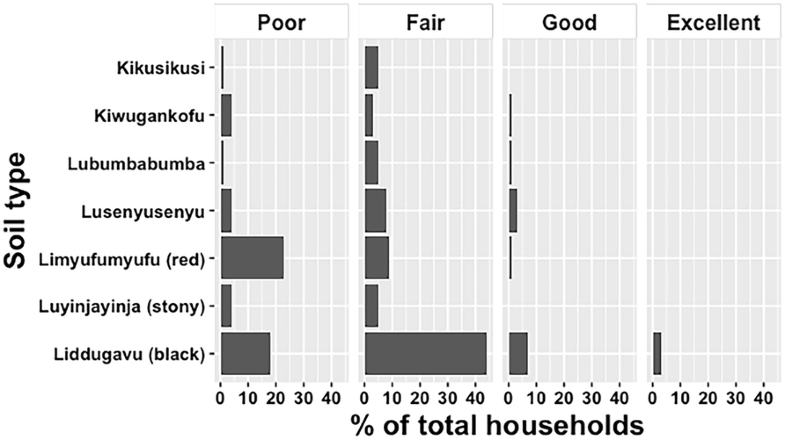 Frongillo and Nanama  found economic status to be negatively correlated with food insecurity in northern Burkina Faso. Abafita and Kim  used two measures of household food security, a self-reported food security status and a multidimensional index generated through principal component analysis, to identify important food security determinants in Ethiopia. Their ordinary least squares (OLS) regression analysis found age, education, rainfall, livestock, off-farm activities, and soil conservation to be significantly and positively related to household food security. Natural assets (land and soil), on the other hand, are less studied in the context of food security. Good quality soil, for example, is a key factor in agricultural productivity but is rarely analyzed as a food security predictor . Depletion of soil fertility is a major biophysical cause of low per capita food production in Africa. Small-scale farmers often remove nutrients from the soil when harvesting crops and the associated biomass without adding inputs, thus creating a negative soil nutrient balance . Mining of soil nutrients in Africa is estimated at annual depletion rates of 22 kg N, 2.5 kg P, and 15 kg K per hectare of cultivated land over the 30 years since 1975 [11, 12]. These practices contribute to declining productivity. A series of experiments conducted on tropical soils determined that yield decline follows a curvilinear, negative exponential pattern with different soils showing different degrees of impact . For example, Ferralsols (35% of the tropics and subtropics) have low resilience to soil nutrient loss, meaning that once vegetation is removed they degrade quickly . However, research on cause–effect relationships linking soil quality degradation to food production is scarce, especially for soils of SSA . According to , during the last 50 years the population of Uganda increased by a factor of five while food production increased by a factor of three; the latter involved doubling the food cropping area but only 50% increase in yields. This paper examines household food security in relation to socioeconomic factors, soil quality, and crop yields. In this paper, soil quality refers to the ability of soil to sustain crop productivity. Food security, measured as the number of meals eaten per day at household level, has been assessed by other researchers [17–19]. Predictors of food security are determined using a multivariate logistic regression model [7–9]. The following hypothesis was developed based on the presented evidence: Socioeconomic status, soil quality, and crop yields are associated with increased meal consumption per day with seasonal variability. Farmer interviews were conducted during September–October 2015 in Masaka District covering six sub-counties (Bukakata, Mukungwe, Buwunga, Kabonera, Kyanamukaka, and Kyesiga) and one division (Katwe-Butego). In total, 150 smallholder farmers were interviewed representing 92 villages and 30 parishes. One objective of this survey was to collect data on demographics, soil type and quality, soil management practices, farming practices, and off-farm income. 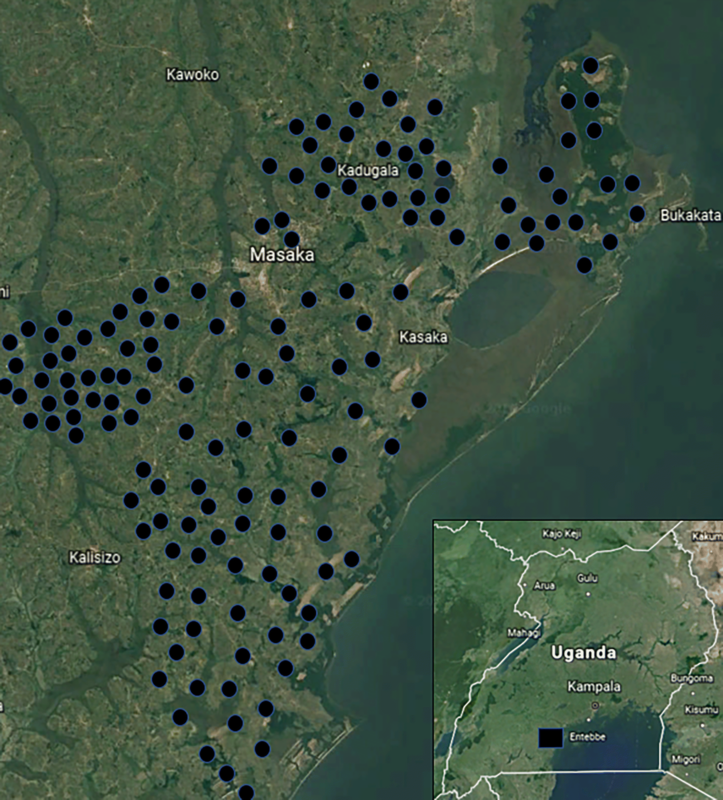 Figure 1 shows the location of the households surveyed in Masaka. Additional file 1: Table S1 shows the conversion of local units to their equivalent in kg as well as the time it takes for each crop to reach physiological maturity. Masaka District is one of the most densely populated (245 people per square kilometer) in Uganda due to its favorable climate and proximity to Lake Victoria. Annual rainfall ranges from 1100 to 1200 mm during two rainy seasons, which allows for two growing seasons per year. Temperatures range between 10 and 30 °C . Topography of the region is characterized by hills and ridges with an average altitude of 1150 m above the sea level. Masaka District has a total area of 1603 km2, half of which is land and the other half is wetlands . The dominant coffee–banana crop production system is supplemented with cassava (Manihot esculenta Crantz), sweet potatoes (Ipomoea batatas [L.] Lam), beans, groundnuts (Arachis hypogaea L.), and maize. High population density and growth have led to agricultural land fragmentation, cropping intensification, deforestation, and decreased soil fertility. Despite the region’s good climate and overall fertile soils, the quality of those soils has been deteriorating at a high rate. In Masaka District, soil degradation was estimated to affect 50% of the area . The situation is exacerbated by insufficient soil conservation practices due to lack of knowledge, interest or incentives. This makes Masaka District susceptible to food insecurity and a good site to study the dynamics of soil quality and food production. An estimated 73% of all households in the district depend on farming for their livelihoods . District-level administrative units consist of sub-counties, parishes, and villages. To choose 150 farmers, five villages were randomly chosen per parish. Then, one to six farmers were identified in each village with an average of two households per village. Farmers were identified from either farmer training records kept by local extension services or by village leaders. A list of all potential farmers (approximately 500 farmers) was created and then used to randomly select 150. In order to capture cross-village variation, the number of farmers surveyed per village was limited to a maximum of six. Farmers interviewed represented a range of locations and farming systems. Interviews consisted of 22 questions covering agricultural production and food security topics. Interviews were conducted by two researchers. The majority (66%) of those interviewed were women age of 30 or older. Most farming households had four to seven members. Most farm sizes were between one to two hectares, with the average size of 1.61 ha. Seven or eight years of primary schooling was the most common educational level achieved. Only 32% of farmers surveyed had access to electricity. The concept of food security is complex and includes availability, access, affordability, use, and stability of food [1, 22]. 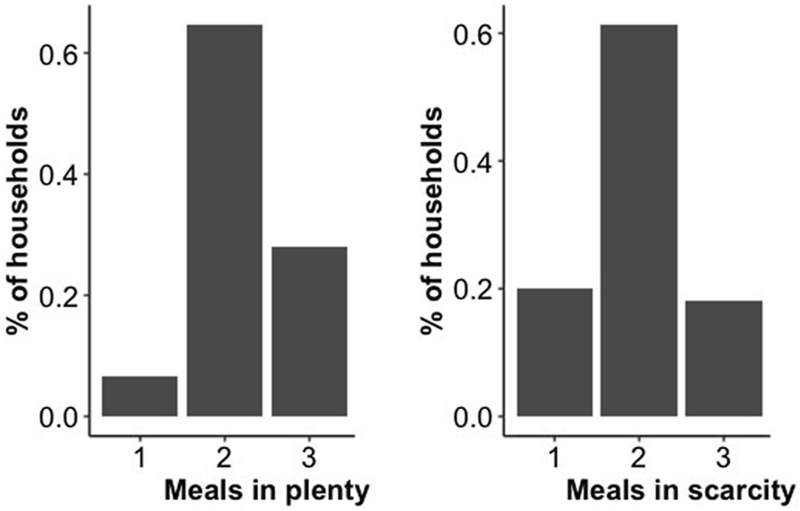 This study focuses primarily on food availability, considering a household ‘food secure’ when household members eat more than two full meals a day. The study captured meal consumption during the season of scarcity and plenty. The same measure was used by  to examine food availability on a seasonal basis, and  who found that inter-annual and intra-annual rainfall variability has a negative impact on food security. The ‘season of plenty’ refers to the period right after harvest, and it usually occurs from June to August, and December to February in Uganda. The ‘season of scarcity’ coincides with the periods of intensive agricultural production activities, which are from March to May, and September to November in Uganda. Socioeconomic factors are commonly considered to explain variation in food security among poor households . Bashir et al. used household size, education, livestock, and income to understand variation in food security in rural Pakistan. Mengistu et al. used marital status, household size, livestock, and income in their study. Omotesho et al. used household size and farm size. The current study used four continuous variables (total amount of land to which a farmer has use rights, years lived in village, household size, and education) and two binary variables (off-farm income and access to electricity) as socioeconomic indicators. Crop production variables include soil quality and crop yields (coffee [Coffea robusta (L.) Linden], banana (Musa × paradisiaca L.), beans (Phaseolus vulgaris L.), and maize (Zea mays L.)). Eleven variables (household size, education, years lived in a village, total acreage, soil quality, banana yield, coffee yield, maize yield, beans yield, electricity, and off-farm income) are used in a multivariate logistic regression model for each season to determine which variables are associated with having three meals per day (compared to two or less). The soil quality variable has ordinal categories (responses: poor, fair, good, excellent) which reflect farmers’ knowledge and terminology used when describing their soil. Farmers were asked to characterize their soil according to those ordinal categories and explain their characterization which was confirmed through observations of the soil and crops by the researcher and extension agent. This reduced subjectivity among farmers’ responses. Soil type is a categorical variable that is based on farmers’ indigenous nomenclature taking into account soil color and texture. Seven soil types are most common—liddugavu (black fertile soil), luyinjayinja (stony soil), limyufumyufu (red soil), lusenyusenyu (sandy soil), lubumbabumba (rich in clay soil), kiwugankofu (silty and dusty soil), and kikusikusi (brown soil). Crop yields were calculated based on farmers’ reported acreage and harvested amount for each crop, which produced values that are not normally distributed, and hence, the natural logarithm of yields was used [28, 29]. Household size, education, years lived in a village, and total acreage are continuous measures. Analyses were performed in R 3.4.0 using the stats package by the model fitting functions glm () . The analysis employs multivariate logistic regressions to identify relationships among variables. Multicollinearity was not a problem since the variance inflation factor did not exceed the cutoff value of 2 for any of the independent variables. Only 84 observations were included in the first regression analysis because not all households grew all four crops chosen for investigation. All 150 observations were included in the second regression that analyzed soil quality and number of meals. The results are reported in odds ratios (OR), which are calculated by exponentiating the variables’ coefficients. This measure tells the expected change in the odds ratio of meals per day for each unit increase in each variable. A logistic model provides a better fit to the data if it demonstrates an improvement over the intercept-only model (null model). An improvement over this baseline is examined by using the likelihood ratio test using lrtest () function from the lmtest package in R . The H0 holds that the null model is true and a P value for the overall model fit that is less than 0.05 provides evidence against the null model. Goodness-of-fit statistics assessed the fit of logistic models against actual outcomes by using the hoslem.test () function from the ResourceSelection package in R . The Hosmer–Lemeshow test, an inferential goodness-of-fit test, yielded χ2 of 6.748 and 10.516 for the plenty and scarcity models (Table 1), respectively, and was insignificant for both models (P ≥ 0.05), suggesting that the models were fit to the data well. The results indicate that total acreage, and banana, maize, and bean yields are positively associated with meals per day, while off-farm income is negatively associated. Even though soil quality was not significant, we chose to analyze it further. Soil quality represents a natural asset, and, due to limited research on the role of natural assets in food security, we decided it was appropriate to continue investigating this determinant. Additionally, soil quality is expected to play a bigger role in food security due to climate change, agricultural intensification, and increasing population; by continuing to analyze soil quality, we can assess its significance for food security in Uganda. In both seasons, farmers’ modal response was two meals per day. As Fig. 2 shows, during the period of scarcity, 20, 61, and 19% had one, two, and three meals, respectively. During the period of plenty, corresponding values were 7, 64, and 29%, respectively. Thus, the ‘period of scarcity’ is very aptly named for a significant proportion of farming households. When considering both seasons, 13.5% of households have one meal per day. This number differs from the six percent reported by the World Food Programme in 2013 for Uganda’s rural and urban populations . This difference is likely due to higher meal consumption rates in urban areas. Indeed, according to the same study, in the country’s capital city, Kampala, only five percent consumed one meal per day. Our results show that eating only one meal per day is much more common during the season of scarcity when food availability is less and costs are higher. In the season of plenty, the odds ratio of having more than two meals increased with total acreage, and banana and bean yields. The significance of banana and bean yields in the season of plenty could be attributed to banana’s importance as a staple energy food and to beans’ role as the main source of protein. During the period of scarcity, the odds ratio of having more than two meals was negatively associated with off-farm income and positively associated with total acreage and maize and bean yields. The negative association might be explained by households diverting their food growing time to non-food related income earning activities, or by households with limited agricultural resources being forced to rely on non-agricultural activities yet earning income too low to ensure food security. Five variables (off-farm income, total acreage, and banana, maize, and bean yields) are all associated with our measure of food security. In the season of plenty, each additional acre increases the probability of food security by 44%, and each unit increase in ln banana and ln bean yields is associated with greater probability (86% and 121% higher, respectively) of food security. During the period of scarcity, each additional acre is associated with 70% higher probability of having more than two meals. During the same period, off-farm income lowers the probability by 87% while ln maize and ln bean yields are associated with 157% and 218% higher probability, respectively. Table 1 contains data regarding factors associated with the odds ratio of household members eating more than two meals per day during seasons of scarcity and plenty. Total acreage and bean yield are the only variables that are significant in both seasons. Both variables are especially important in the season of scarcity when the probability of having more meals is greater than in the season of plenty. Land size was also important for food security in Kenya because larger and higher quality land endowments allow accumulation of cash and livestock, both of which are related to improved food security . The significance of total acreage could also be related to total crop production. It was previously demonstrated that households with insufficient food availability obtained the majority of their energy from crops produced on-farm . Beans are important in food security because it is a staple crop for dietary protein in East Africa . In Uganda, common bean ranks third as the most widely grown crop and is the most important source of protein . In Uganda, banana, maize, beans, and cassava are the staple food crops grown primarily for home consumption, and they are commonly intercropped. Coffee is the main cash crop for rural households and is most often intercropped with banana; beans and maize constitute another common intercropping system. Cassava is often sparingly grown in bean–maize systems. These farming practices obfuscate crop planting areas and yields. As many farmers operate under subsistence conditions, they tend to consume their crops during the growing season and sell them incrementally before, during, and after the harvest. These factors could contribute to the low or non-significance of crop yields data by making them spatially and temporally dispersed . Banana, however, is the most important staple food of the central region where ‘matooke,’ mashed steamed green bananas, is eaten as often as three times a day. Banana ‘plantations’ are grown close to the house and often receive more household organic food scraps in addition to ash, which might contribute to improved soil quality and yields . However, farmers have been reducing the size of their banana ‘plantations’ in the region due to increased pest and disease problems. Banana weevil, banana bacterial wilt, sigatoka and nematodes are the most common problems . The role of banana in the diet of the central region, therefore, is expected to change in the future as farmers are slowly replacing banana plantations with new crops. These changes will influence farmers’ food consumption patterns. Off-farm income was another significant variable in the analysis. Off-farm income was negatively associated with the number of meals. This can be due to more time being diverted to non-food production activities. According to the survey, 27% of the farmers spent their off-farm income on school fees, which further contributes to the idea of non-farm income earning activities competing with food production efforts. Similarly, some East African studies on the effects of off-farm income found decreased agricultural production with increased off-farm income . Off-farm income was also found to be more important in households with higher food availability . It may be that the households in this study are too food insecure and/or poor for off-farm income to make a difference in their food security status. Another important characteristic in crop production is acreage prioritization according to crops. Figure 3 shows crop acreage distribution for coffee, banana, beans, maize, and cassava. As shown, smaller fields are associated with a greater variety of crops while coffee and banana start to dominate from 0.75 ha upwards. Figure 4 shows the crop acreage relationships for coffee and the four staple crops (banana, beans, maize, and cassava), with banana and cassava acreages being positively associated with coffee acreage. 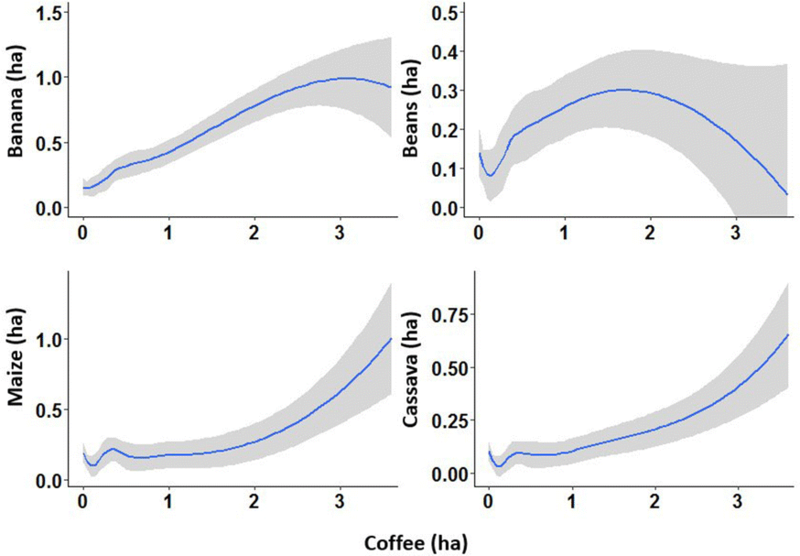 Coffee is favored relative to beans in large farms as shown by the smaller size of bean fields relative to coffee in farms with 1.5 ha or more of land. This can be due to either widespread pests and diseases or general preference for coffee over beans. A study by  found that farmers derived more income from coffee than from other crops such as beans and maize. Preference for coffee as a source of income could potentially lead farmers to allocate land to cash crops, leaving them with less land for growing staple crops. It also indicates that farmers grow a great diversity of crops on smaller acreages, which supports the claim that beyond a certain acreage coffee is grown as a monocrop. On the other hand, having large coffee acreage generates extra income which improves farmers’ livelihoods. However, with the current trends of climate change and the rapid spread of pests and diseases in central Uganda, having large acreages under any one crop creates risk for farmers. The majority of soils in Masaka District are Ferralsols, which are old and highly weathered . These soils used to be quite fertile, but due to land use change and mismanagement they have become among of the poorest . In the study area, the most common soil types identified by the farmers are black (Phaeozem) and red (Ferralsol). Figure 5 shows seven local soil types classified by the criteria that were identified by farmers and their perceived quality based on crop yields. The black soil was most often described as fair in quality, while the rest of the soils were perceived as fair or poor. Only a few farmers reported their soil as excellent; therefore, this soil quality was excluded from the regression analysis. Only 40.6% of farmers used a soil conservation practice, with no farmer using more than one. The most common soil management practice was digging of trenches (14.0%) followed by burying of weeds (6.3%), compost manure (4.9%), fallowing (4.2%), and green manure (2.8%). The primary analysis did not find soil quality to be significant, but we chose to look at it because it is often ignored in food security studies. Additionally, soil quality is expected to have a bigger impact on food security in SSA with climate change and growing populations. When the soil quality variable is analyzed in isolation, the regression analysis shows a direct relationship between soil quality and the number of meals consumed by a household. Table 2 presents regression coefficients and odds ratios for soil quality and three meals a day versus two meals or less. Soil quality reported as good is statistically significant in both seasons, thus indicating that there is a strong positive relationship between good soil quality and having three meals a day. However, because the primary analysis did not find soil quality to be significant and the second model is limited in scope, these results can only imply a positive association between soil quality and number of meals. Most (80%) farmers who characterized their soil as either poor or fair were having two or fewer meals per day. 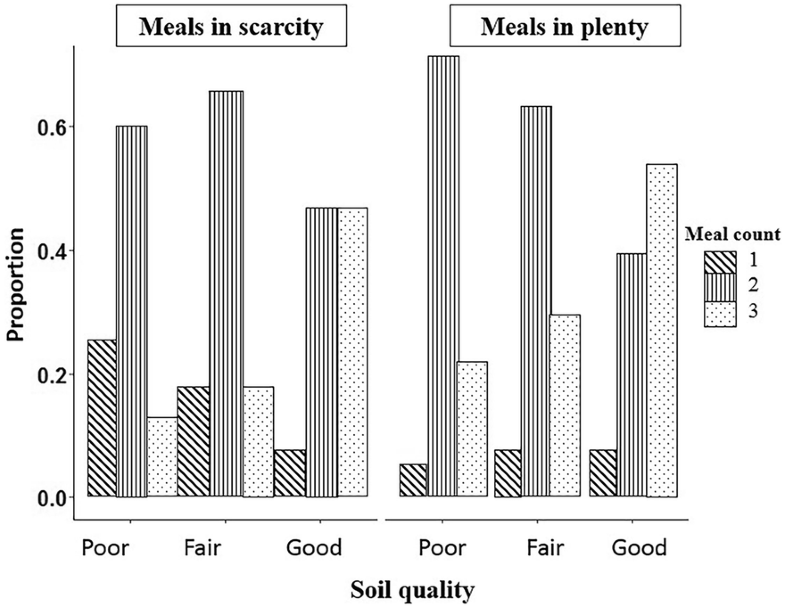 Half (50%) of farmers with good soil quality had three meals per day. The odds ratio of having three meals per day is more than five times as high for soil characterized as good compared to fair during the season of scarcity, and nearly four times as high during the season of plenty, respectively. This indicates that households with poor soil quality experience greater food insecurity in the season of scarcity. Figure 6 shows the proportion of farmer household meals per day in seasons of plenty and of scarcity grouped by soil quality types. Results only partially support the hypothesis because only socioeconomic and crop production determinants were found to be associated with increased meal consumption. The study acknowledges the limitations that are associated with measuring food security only by the number of meals eaten per day. The central Ugandan diet is rich in calories but generally lacks amino acids . Additionally, by classifying a household as food insecure only because its members eat two or fewer meals a day could be an inaccurate representation of the reality. Some households eat only two meals a day but in large quantity which eliminates a need for more meals. Therefore, more indicators such as caloric and nutrient intake should ideally be measured when analyzing determinants of household food security status. Crop yields were calculated from crop production and area planted data that were based on farmer recall. In some instances, farmers were not sure about the size of their land or their crop production. In these cases, the interviewer (with the help of a skilled extension agent) probed farmers to develop an estimate. However, this method produced data that are not normally distributed, and hence, yield transformation with natural logarithm was made. Direct field measurements would have produced more accurate values among farmers. Soil quality was recorded based on farmer recall. Even though farmers generally know the quality of their soil, the rating of soil quality in a given field could vary among farmers for non-objective reasons. We operated under the assumption that all farmers used the same criteria to characterize their soil. The survey was designed to gather relatively simple indicators that are comparable across villages and farming systems. Therefore, the information gathered on any one topic, such as food security, was not as in-depth as is possible in location-specific surveys. This paper examined household food security in south-central Uganda by analyzing soil quality, crop production, and socioeconomic factors. Five factors were found significant: total acreage, off-farm income, and banana, maize, and bean yields. Total acreage and bean yield affect food security in both seasons unlike the other factors. The study also found that the majority of crops are grown on either poor or fair soils and that the number of meals is higher in both seasons for households with good quality soils compared to those with fair soil quality. The study also found that smaller farm size is associated with a greater variety of crops, while larger landholdings permit growing coffee as a monocrop. The results indicate that land size and crop yields determine rural household meal consumption in south-central Uganda. However, the importance of soil quality in food security is expected to increase with the fast growing population. In the near future, we recommend that land fragmentation and low crop yields should be addressed to improve food security in rural Uganda. In the long term, we recommend further research on food security using the sustainable livelihoods approach which includes natural assets such as soil quality. Both authors conceptualized the survey. NA designed the survey, analyzed data, and wrote the paper. RM edited and proofread the paper. Both authors read and approved the final manuscript. We thank Dr. Moses Tenywa from Makerere University for his assistance with data collection in Uganda. We also thank all farmers and extension officers from Masaka District who partook in this study. The data supporting the results presented in this study are available from the corresponding author upon reasonable request. Farmer participation in the survey did not involve any risk to farmers. Hence, the study had been exempt from the requirements of the human subject protections regulations. Prior to the interviews, farmers were informed about the purpose of the study and asked for their verbal consent to participate. It was stated that the data collected would be treated confidentially, analyzed anonymously, and used only for research purposes. This work was supported by U.S. Agency for International Development (USAID) through the Feed the Future 21st Century Borlaug Leadership Program (8000066664 GS 129805/400-77-11). 40066_2018_237_MOESM1_ESM.docx Additional file 1: Table S1. Crop growing seasons, traditional units of measuring harvest and their equivalent in kg. FAO. Rome Declaration on World Food Security. World Food Summit, 13–17 of November 1996, Rome, Italy. 1996. http://www.fao.org/wfs/index_en.htm. Accessed from FAO Corporate Document Repository, 13 January 2015. Food and Agriculture Organization of the United Nations (FAO). The state of food security and nutrition in the world: building resilience for peace and food security. 2017. http://www.fao.org/3/a-I7695e.pdf. Accessed 25 Dec 2017. R Core Team. R: a language and environment for statistical computing. R Foundation for Statistical Computing, Vienna, Austria. 2013. URL http://www.R-project.org/. Accessed 10 Nov 2016. McKinney P. Comprehensive food security and vulnerability analysis: Uganda. Kampala: WFP; 2009. https://doi.org/10.1002/yd.20093.